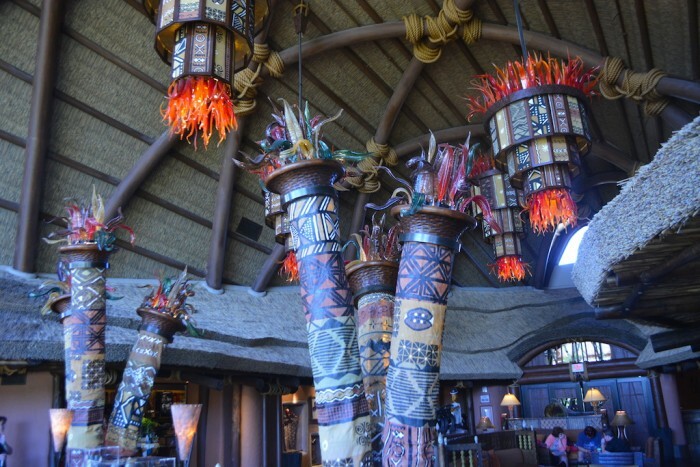 This week’s SATURDAY SIX takes a look at Six Reasons We Love Disney’s Animal Kingdom Lodge. 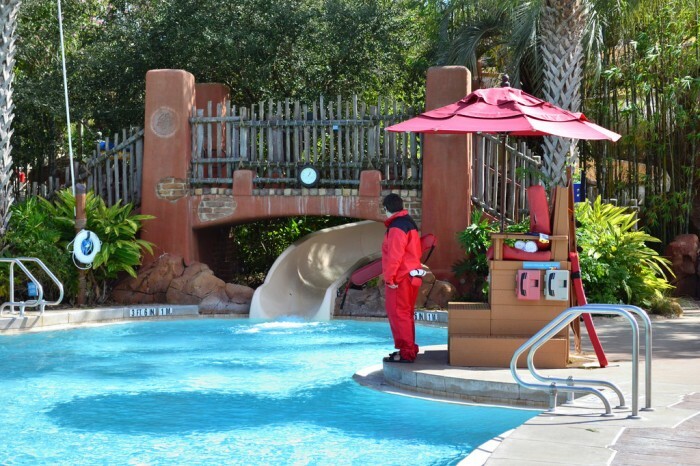 Each of Walt Disney World’s onsite hotels have their own unique feel, and that rings true from the value end (such as Art of Animation) through the moderates (including Port Orleans French Quarter) and all the way up to the deluxe resorts like The Contemporary. That said, no hotel in Orlando stands more by itself as a one-of-a-kind original experience than Disney’s Animal Kingdom Lodge. Animal Kingdom Lodge is broken up into two parts, the main hotel (Jambo House) and the Disney Vacation Club wing (Kidani Village.) In these two areas there are three of Disney’s best restaurants including Boma and Jiko at Jambo House, and Sanaa at Kidani Village. 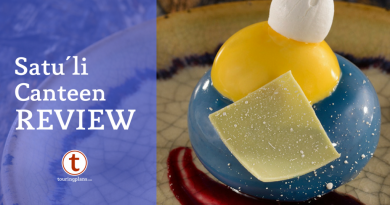 Unlike many restaurants at WDW that have dumbed themselves down in order to maximize profits as part of Disney’s Dining Plan, AKL’s restaurants deliver an experience that is true destination dining. The standout of these three venues is Sanaa’s bread service. 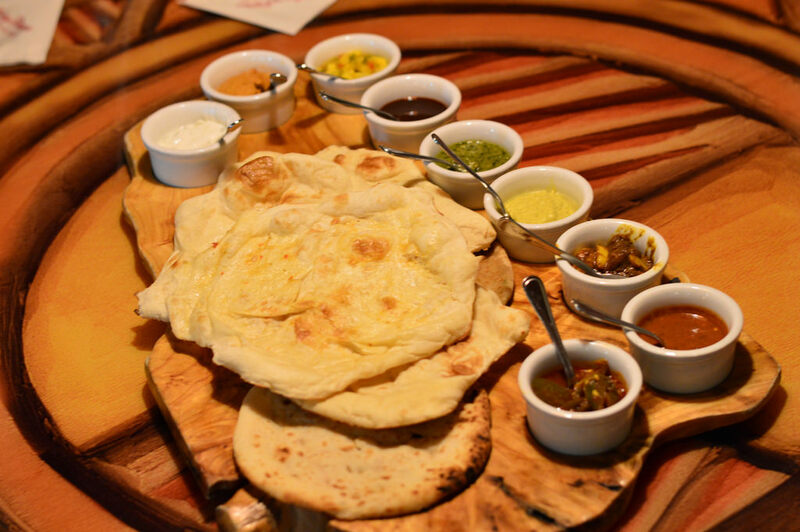 With five different types of Naan bread available and up to nine different accompaniments to go with it, this is a bread service like no other. The current pricing for this bread service includes a choice of three breads and three accompaniments for $10.49, or all nine accompaniments for $12.99. This may be one of the best values on Disney property as not only are you getting an amazing amount of food, but the presentation and overall taste factor is through the roof. 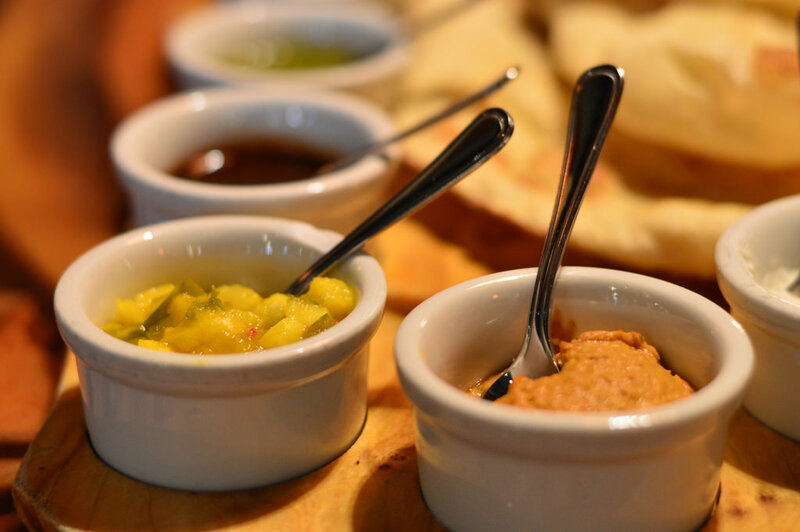 You can also add extra pieces of Naan bread for $2.00 each, and this is one appetizer that the entire table can share the experience of. Pretty much anyone who has ever tried the Sanaa bread service becomes an immediate apostle for it. including our friends the Disney Hipsters. It’s that good. Let me remind you that guests do not have to be staying at the Animal Kingdom Lodge to enjoy lunch or dinner at any of the onsite restaurants. Reservations are encouraged, however you can also order the bread service at Sanaa’s bar area if you can not score an ADR, or just want to walk up. Other dining highlights at AKL include Boma’s amazing buffets for breakfast and dinner, and Jiko’s award winning menu and shockingly large amount of wines from South Africa. How extensive is their wine list? Jiko actually came in 11th in Food & Wine’s 50 Most Amazing Wine Experiences in America. If you find yourself eating the same old hamburgers, chicken nuggets, or ubiquitous pizza flatbreads on your next Disney vacation, do whatever you can to at least make one stop at AKL to try something different. You will not be sorry. PRO TIP: Sign up for the free culinary tour at Disney’s Animal Kingdom Lodge. A Zebra Dome looking out from a Kidani Village balcony. Not exactly sure what the five best views at WDW are, but this is one of them. Walt Disney World has some amazing lobby experiences across property, including Wilderness Lodge and the stately Grand Floridian, but we love our first steps walking into Jambo House and Kidani Village. The huge open feeling of Jambo House is breathtaking, along with the stunning chandeliers above. You walk into the lobby of Jambo House on third floor of the resort, and right below you are the restaurants Boma and Jiko, so while walking near that area you will get some amazing smells that almost have you floating towards those restaurants like Yogi Bear to a picnic basket. There are many areas in the lobby to just sit down and take in all the atmosphere, including next to crackling fires. 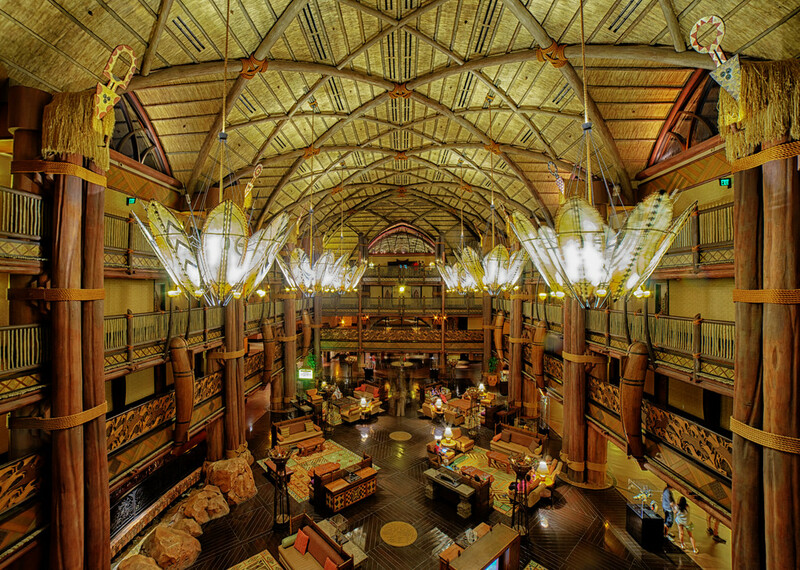 Disney in general is very good about transporting you away from the Real World, but Animal Kingdom Lodge just might be the best at accomplishing that feat. Kidani Village’s lobby is much more intimate than Jambo House, but it has elements that really give it the wow factor including large lighting fixtures made out of blown glass to resemble fire, as well as an unbelievable look into the savanna area. 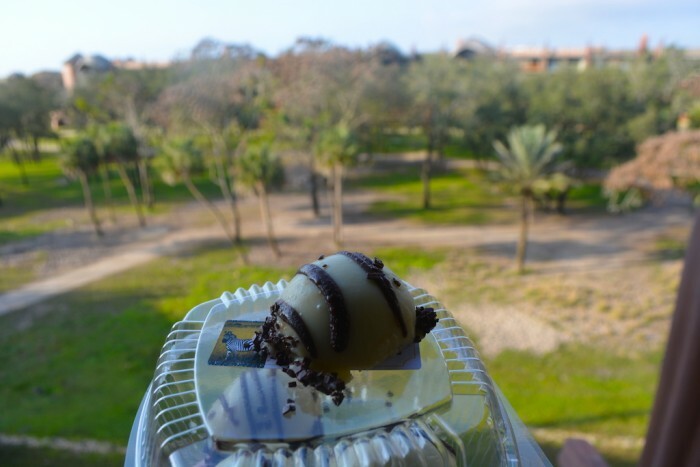 There are two large outdoor viewing areas at the end of Kidani Village’s lobby, and we love to grab a pack of Zebra Domes and just sit on a huge rocking chair watching the zebras and giraffes graze. This is the type of experience that separates Disney from its competition, and one that you will remember for years. It is very rare when merchandise makes our list for things that we enjoy at Disney resorts because, let’s face it, for the most part the merch at the hotels stink. It’s the same stuff literally everywhere. The toys and shirts you see at Port Orleans Riverside are the exact same ones you will find at the Grand Floridan and Pop Century. 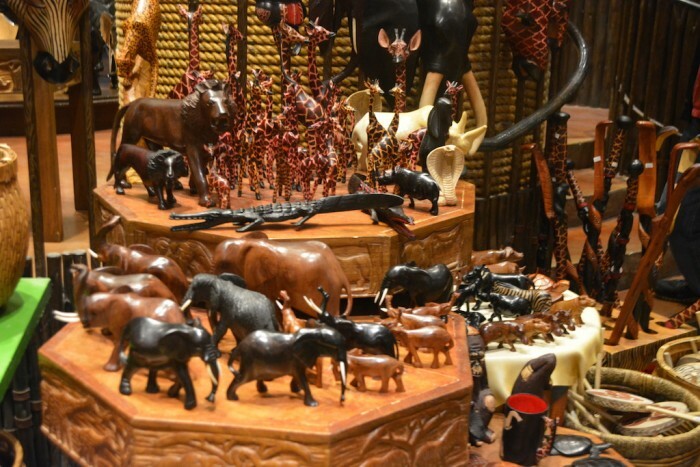 The gift shops at Animal Kingdom Lodge are not like this. 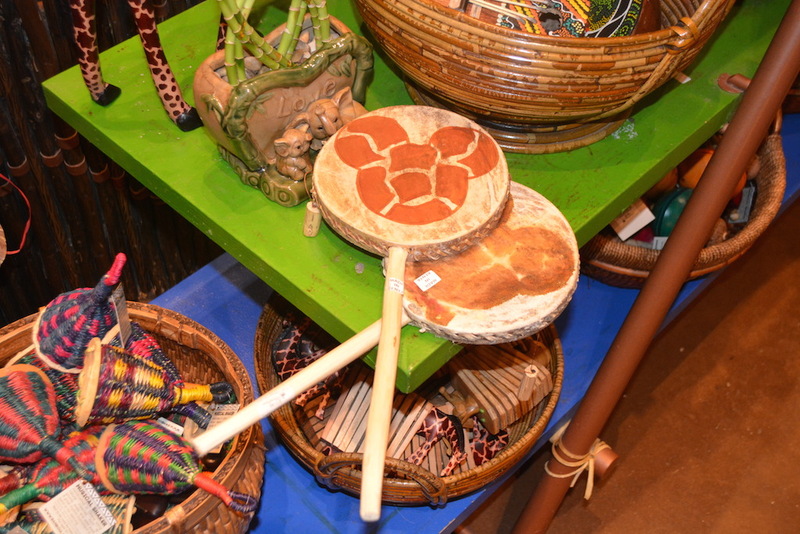 Jambo House’s Zawadi marketplace is one of my favorite stores on Disney property. It is HUGE and filled with many items you can’t get anywhere else at WDW. 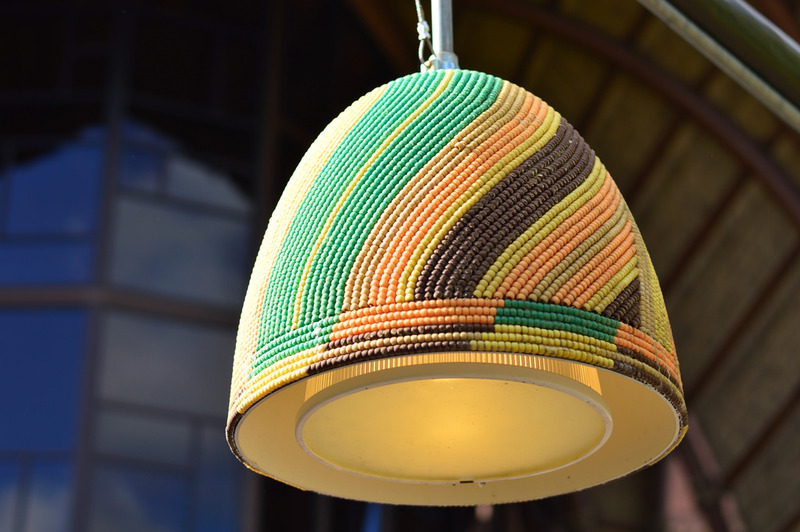 There are unique pieces of African art and clothing. There are a ton of different types of instruments, all of which at least feel handmade and not off an assembly line. Johari Treasures at Kidani Village is much smaller than Zawadi, but it also offers a decent amount of unique items that can let you deliver a more interesting story when you return home to tell your friends, family, and coworkers about your trip. Five, Ten, Twenty years from now you probably won’t remember where you got your Disney Parks 2015 t-shirt, but seeing your small bongo drum is more than likely going to instantly bring back vivid memories of AKL. 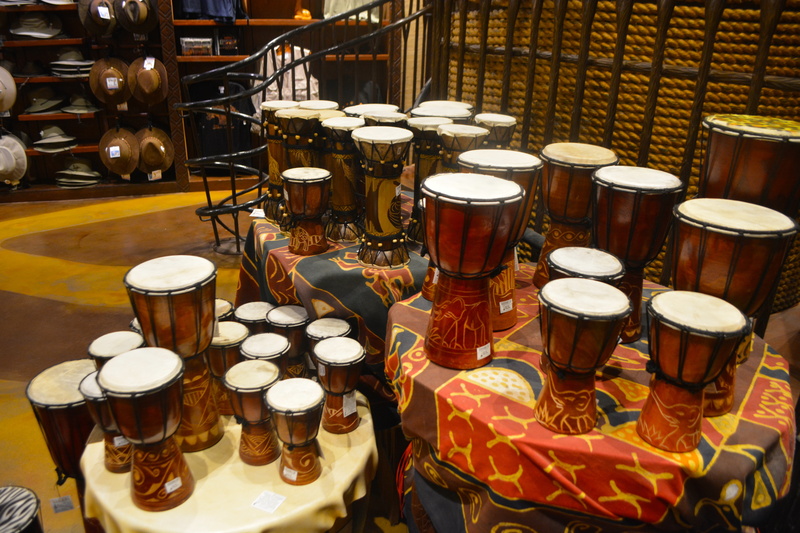 A selection of just some of the drums at Jambo House’s Zawadi marketplace. To say the three year old boy in party was a fan of these may be the understatement of the year. Some of the unique items available at Animal Kingdom Lodge’s gift shops. PRO TIP: In the refrigerated cases at the back of the Zawadi Marketplace you will find several bottles of African beer available, including Tusker Premium Lager. 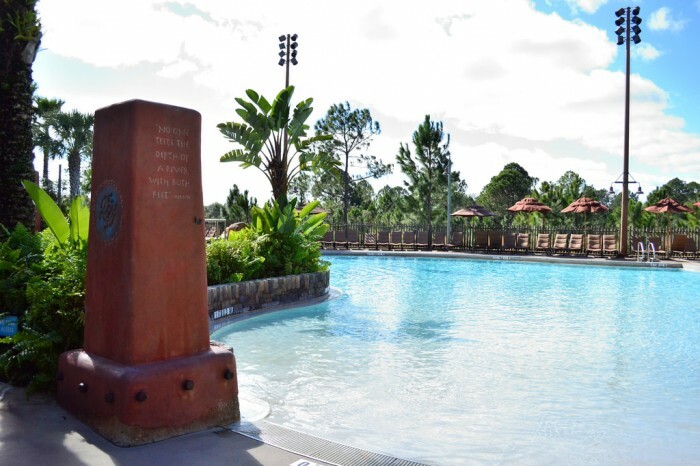 More and more of my trips to WDW and Universal have young children in my family accompanying me, which means pools are becoming a bigger and bigger factor in deciding where we choose to stay. The Uzima pool at Jambo House and the Samawati Springs pool at Kidani Village are two fantastic resort pool areas. Both have great slides, including the massive 128 foot slide at Samawati, which is among the best on property. Directly next to Samawati is the incredible Uwanja Camp, an elaborately themed playground featuring water cannons, a bubbling geyser, and a huge water tower. I am a huge proponent of encouraging guests to build in a “resort day” to their week long WDW vacations, but AKL’s pool areas are also the perfect way to decompress after a busy day touring the theme parks. PRO TIP: While the kids are enjoying the pool, adults can enjoy the benefits of Private Dining by the pool. These meals (including Tandori Chicken and Grilled Lamb Kefta) are served in a bento box and will be delivered directly to you poolside. This is it. 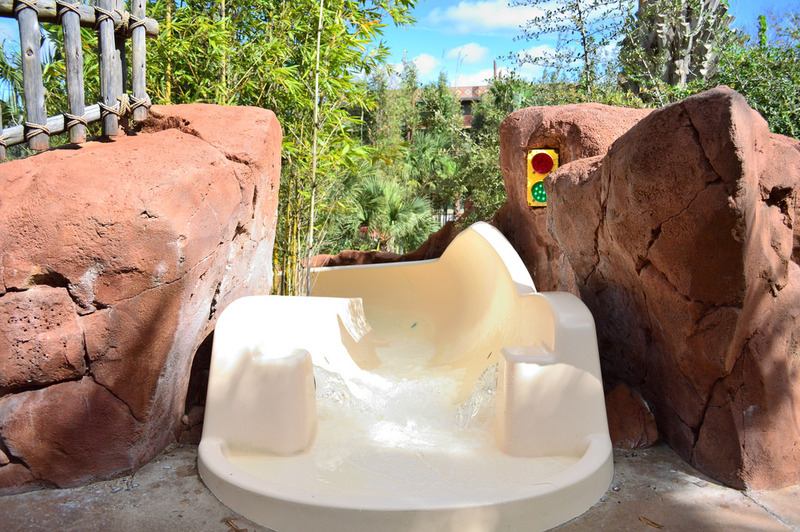 This is by far and away the number one reason to book a stay at the Animal Kingdom Lodge. 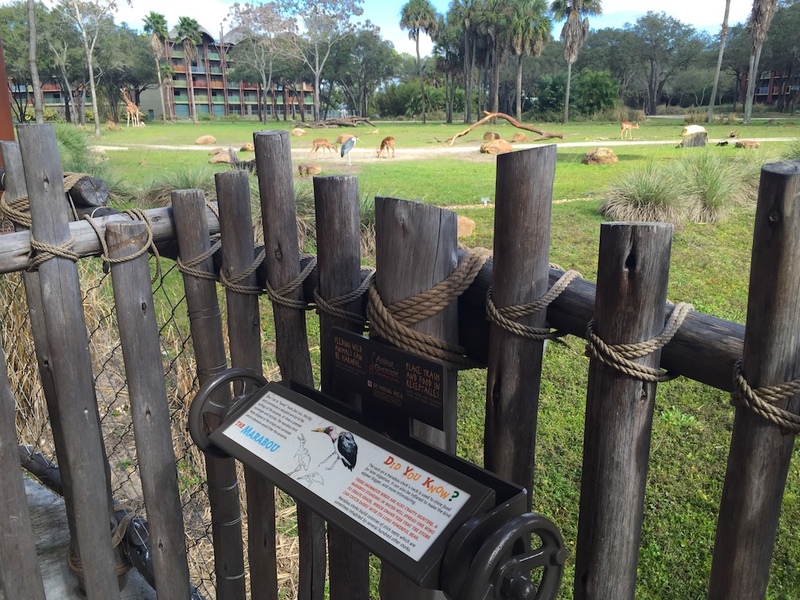 The beautiful savanna areas at both Jambo House and Kidani Village will give you an opportunity to see zebras, giraffes, and almost 30 other animals roaming the grounds. 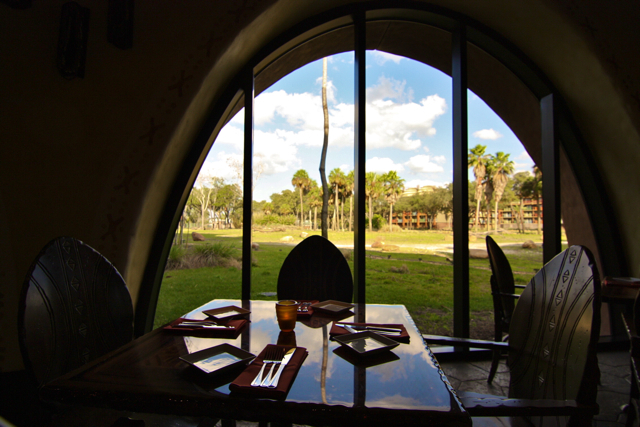 All Disney hotels have some sort of “preferred view” option when it comes to choosing hotel rooms, but “savanna view” at the Animal Kingdom Lodge is right at the top of a very short list of the best views in all of Walt Disney World. You can certainly make a case for “Magic Kingdom view” at, say, The Contemporary, but in my mind a savanna view room is one of the ultimate unique experiences at WDW. 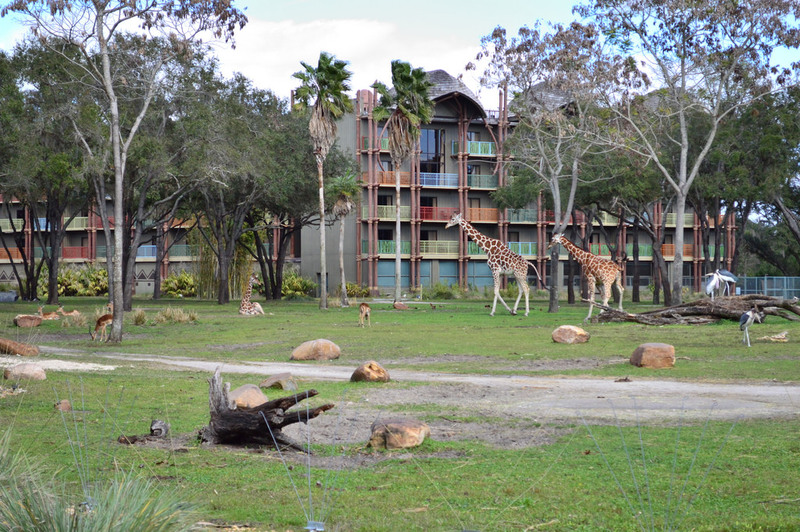 You don’t have to be staying onsite to at least get a taste of what this is like, as both Jambo House and Kidani Village have areas where anyone can walk out and take in the view. There are Cast Members who will answer any questions you have about the area and helpful tools that make it easy to identify what species of animal you are looking it. 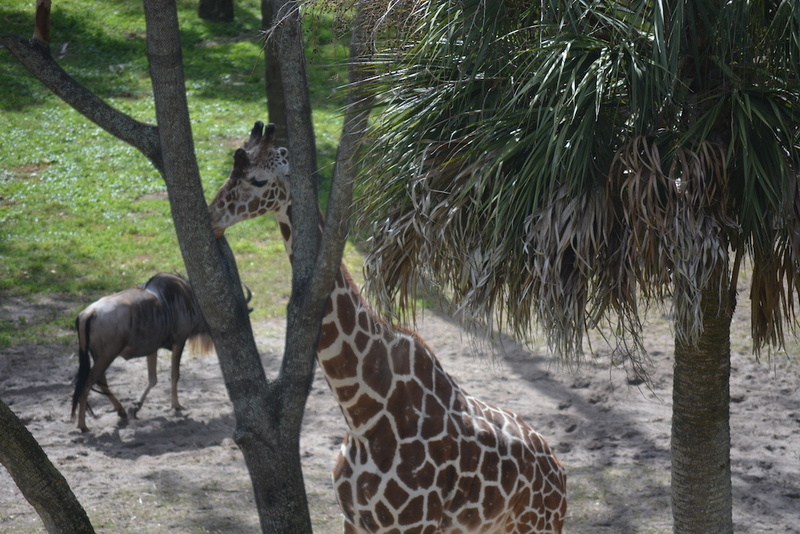 Taken from the balcony of a Kidani Village room. One thing I found truly amazing was how many opportunities there are to experience the savanna. There are huge windows overlooking the area while walking through the hallways of Kidani Village. There are seats at various restaurants with a top notch view. There are nooks and crannies throughout both Jambo House and Kidani Village in which you can just stop, relax, and view something you just can’t see at any other resort in Orlando. One thing that is fantastic about the Animal Kingdom Lodge is that it feels uniquely Disney, but doesn’t hit you over the head with characters or larger than life theming. Everything feels right. While there definitely are hidden Mickeys throughout the resort, in many ways AKL reminds me of the early years of EPCOT Center, before that park became Epcot and transitioned into just another Disney park. 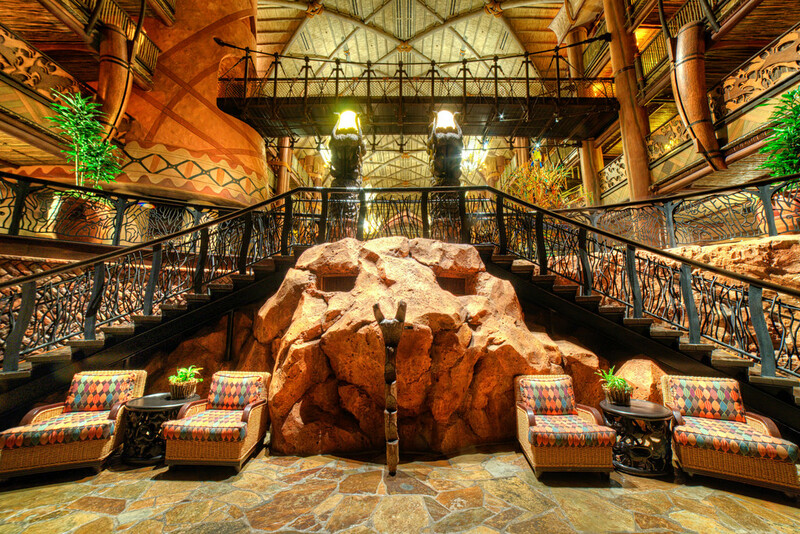 Animal Kingdom Lodge is special, and doesn’t need a three story tall Simba or Mufasa to inform you of it’s African theme. The artwork alone throughout the resort could fill up its own article. The lobbies and hallways are filled with incredible pieces of art straight from Africa, almost to the point where you’re getting a free museum trip with your hotel stay. One of the fun things I like to do at Disney’s Pop Century is walking through the lobby and looking at the back wall filled with Americana. Animal Kingdom Lodge is like that taken to the next level, and it’s everywhere you go. The hint of a mosquito net behind the beds at Animal Kingdom Lodge are a great touch. 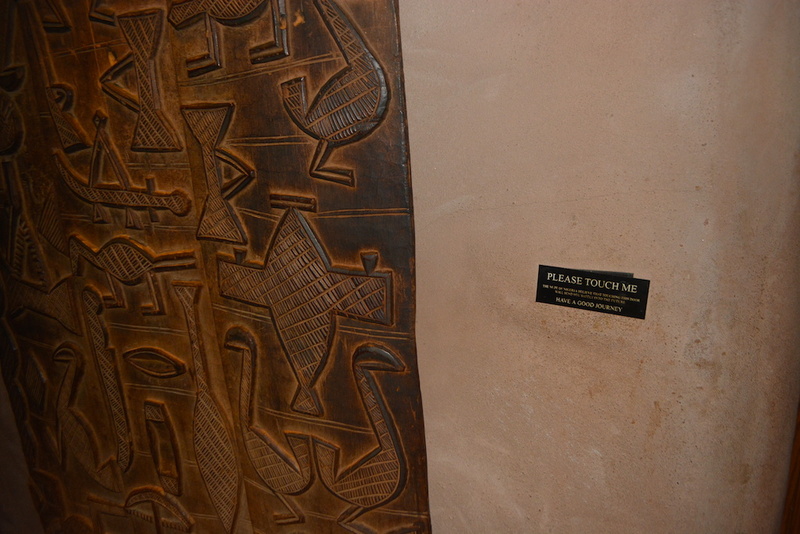 While many areas of WDW have signs that say “don’t touch,” this piece of art at Jambo House encourages guests to touch. Eat your heart out Tangled. 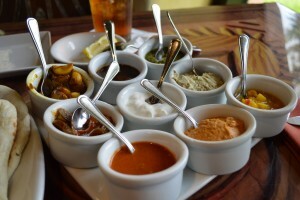 One last look at the Sanaa bread service dipping accompaniments. Special thanks to crack staff photographer Brandon Glover, Disney photographer icon Tom Bricker, photo wunderkind Mike Sperduto, and Megan Stump for their invaluable assistance with this article. Be sure to also check out Brandon on The Park Blogger podcast with co-hosts Aengus Mackenzie and Brian Carey. Satu’li Canteen: The Future of Disney Quick Service? I just love this wonderful article which highlights so many of the fabulous features of my family’s favorite resort! We are so pleased that Disney has allowed AKL to remain unique and subtly authentic, just as you mentioned. It truly is a special getaway. But one thing I don’t understand is why people think it is far away from the parks, or that the buses run longer than those of other resorts. We have stayed there five or six times and I have never noticed this. Perhaps it’s a misconception that comes from the feeling of remoteness? It has even led me to do a few calculations based on travel times to the parks that are posted on a couple of “Disney tips” websites, including Touring Plans, and even the numbers do not show that staying at AKL will give you long bus trips. Perhaps if you only go to MK… But not if you are visiting all the parks. Seriously! But I will concede that someone who expected to feel in the middle of the excitement all the time would not enjoy this aspect of AKL. Thank you for showcasing the resort in such a beautiful way! Thank you for the comments. I always encourage people who are traveling to WDW to rent a car, even if staying onsite and only doing Disney parks. I agree that EVERYTHING is relatively easy to get to on WDW property. The biggest problem with the buses is, as of today, they still don’t have a way to let guests know when the next bus is coming. 10 minutes seems like a half hour when you are just standing there having no idea when your bus will come. This frustration then goes up to the next level when other buses come but not the one for the park you are interested in. When/if Disney puts bus times at the actual stops or integrates into My Disney Experience, I bet people’s complaints/misconceptions about Animal Kingdom Lodge go way down. We did a split stay BLT/AKL last year and the more remote feel of AKL was a great way to wind down after 4 days of being in the middle of everything at BLT. AKL is fantastic as a place to spend a couple of days just hanging around the resort. The pool and play area at Jambo are great, and there seems to be more at-resort programming at AKL than at the other deluxe resorts. I agree that the buses at AKL are no worse than any other resort. I enjoy driving but would never bother taking a car from a resort to a park. You aren’t driving for most of that trip, you’re waiting in line to get into a parking lot, finding a parking space, taking a tram, and walking. Then on the way out you’re trying to find your car amongst 10000 other identical rentals cars and fighting traffic since you’re probably leaving at the same time as everyone else. No thanks, that’s not a vacation. It can definitely be challenging trying to justify the cost of a Deluxe stay versus other venues onsite and offsite. Our one night stay last year at the Contemporary was over $615 for one night. ( http://blog.touringplans.com/2014/10/01/contemporary_atriumclublevel/ ) Granted there were a lot of things that were absolute terrific about that experience, but that’s a tough pill to swallow if you’re a family and looking at spending a good part of your day at the theme parks. 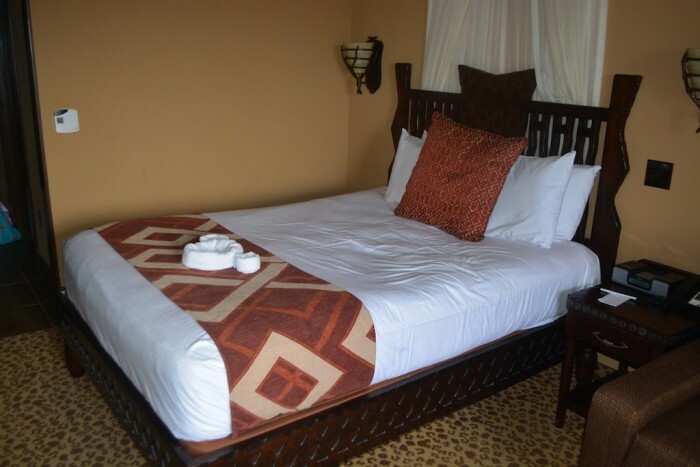 We generally stay at value resorts for part of our trips, and then switch over to a good moderate or a deluxe for the special occasions. Thankfully Disney has been regularly having good discounts for Florida residents and/or Annual Passholders in this area as well. I haven’t looked at cash prices for years thanks to DVC, but when I used to stay cash there were 3 distinct levels of pricing for deluxe resorts. Monorail was the most expensive, followed by Boardwalk area, then WL and AKL. At the time a non-savannah room at AKL was only a bit more expensive than a moderate. A quick look at disney’s website tells me AKL starts at $284/night, and Coronado Springs starts at $175/night. Not a small difference, but not multiple times as expensive either. Poly, on the other hand, starts at $429/night. Polynesian is certainly out of reach. I think my issue with AKL, is for it to be a unique experience, you pretty much need the savannah view, which is a lot more than $284 (it starts at $418). Contemporary, meanwhile, comes in at minimum $356. (Still more than I want to pay for an 11 day stay at WDW, but cheaper than Polynesian by far. Some day… when the kids move out, I’m going to go on a few shorter Deluxe resort trips. Wanted to make sure you know that you can rent points on the mouseowners rent/ transfer site to stay in deluxe DVC accommodation. Dave’s Disney DVC site has points for $14 but if you use their cost calculator, you can see the point cost. I have purchased point the last two years from Mouseowners and use Dave’s site to calculate what I need for my stay. Under $200 a night often, for off season and sometimes closer to $150 for some. The other cheap way is buying Disney rooms through Orbitz when they have a 15 or 20% off Disney’s already reduced prices. Last summer, August/ September is maybe the cheapest to go to Disney, Animal Kingdom Lodge rooms were $162 and POP were $69. I have stayed at four deluxe resorts this way and am working my way through. I usually do a split stay to off-set costs. Good luck! Where was the photo with all the lanterns taken? 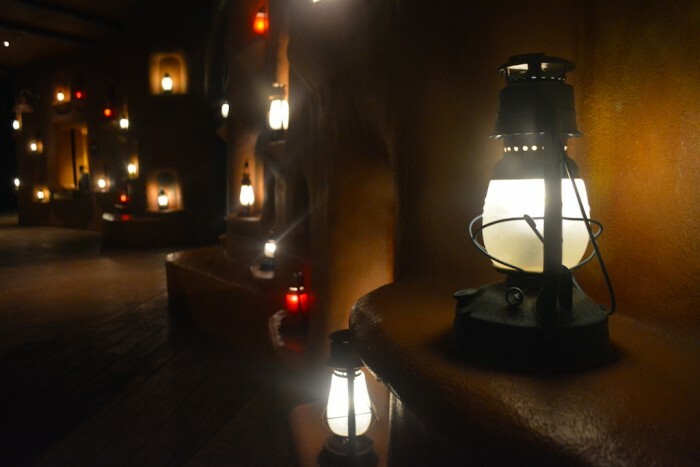 That is the front entrance to Kidani Village at night. Your article is spot on. We absolutely love AKL and can’t imagine staying anywhere else on property. And even though we’ve always had a car while there, we use Disney transportation much more frequently than our own car. Sure we’ve waited sometimes, but the wait has never been unreasonable. If you get the chance, the concierge lounge at AKL is outstanding. “Free” booze all day, you say? Count me in. It is an absolutely gorgeous resort and the only way I’ve been able to stay here is because of my DVC!! Thanks for the details, the photos and the desire to go tomorrow! We’re Pop Century, but that’s because we’re on a tight budget and we’re park commandos. I haven’t tried Sanaa yet, but Naan is always one of the best tasting things at any restaurant that serves it. Just don’t bother buying it at the store. I love Animal Kingdom Lodge and have stayed at both Jambo and Kidani and eaten at all the restaurants several times. I think you article was spot on, except for the restaurant portion. Jiko has some of the best food I have eaten on property – absolutely 4 star gourmet. I cannot believe you chose to highlight Macaroni and Cheese. For those who have never been there, this gives readers absolutely nothing to go on. For example, it has some of the best vegetarian offerings on site. It combines flavours and provides a unique palate experience like no other. It is African cuisine served decidedly upscale. And Saana is another gem. Yes, the bread and condiments side is really good but the curries and other meals are to die for. It has the best kid’s menu on property with salmon and other things my daughter loves. 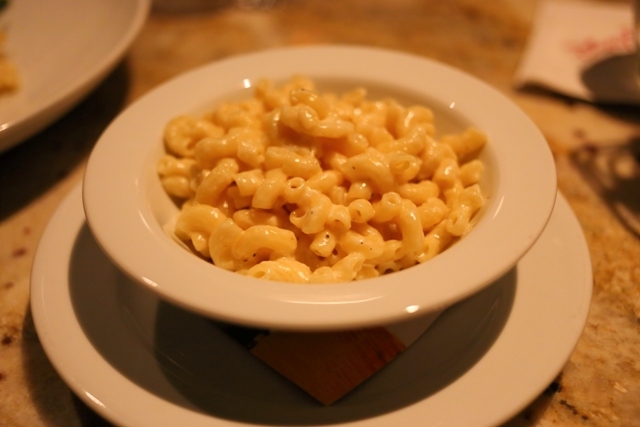 If you go to a four star restaurant are you really just going to eat bread and condiments or macaroni and cheese? Boma is widely considered to be the buffet on property with the best food. It is consistently one my family’s favourite restaurants for all ages, by far. Perhaps you are just not a foodie? Loved the rest of the article but the food portion left me scratching my head at what you chose to highlight. I’ve mainly stayed at the Value resorts over the years but decided to splurge after a canceled trip to Kenya last supper – AWESOME resort and a very unique experience. Travel time to the parks was longer but buses were less crowded and the walks to the bus stops at the parks were shorter so maybe a bit of a benefit. 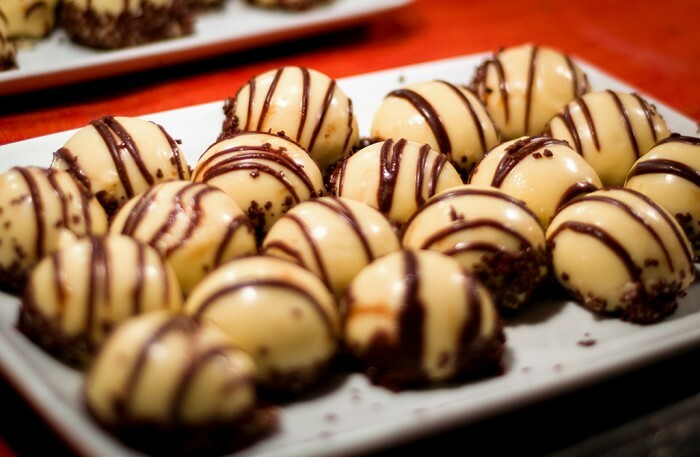 I WISH I knew I could get zebra domes “to go” at Kadani when we were there last week – although maybe not – I might have really packed on some extra pounds. They are unique and YUMMY!